Description of "100 Solved Problems on Units, Dimensions and Measurement"
- Completely solved objective problems. The solutions reveals all the critical points. - Promotes self learning. Can be used as a readily available mentor for solutions. This book provides 100 objective type questions and their solutions. These questions improves your problem solving skills, test your conceptual understanding, and help you in exam preparation. The book also covers relevant concepts, in brief. These are enough to solve problems given in this book. If a student seriously attempts all the problems in this book, he/she will naturally develop the ability to analyze and solve complex problems in a simple and logical manner using a few, well-understood principles. Jitender Singh is working as a Scientist in DRDO. He has a strong academic background with Integrated M. Sc. (5 years) in Physics from IIT Kanpur and M. Tech. in Computational Science from IISc Bangalore. He is All India Rank 1 holder in GATE and loves to solve physics problems. He is a member of Prof. H.C. Verma's team which is dedicated to improve the quality of physics education in the country. Shraddhesh Chaturvedi holds a degree in Integrated M. Sc. (5 years) in Physics from IIT Kanpur. He is passionate about problem solving in physics and enhancing the quality of texts available to Indian students. His career spans many industries where he has contributed with his knowledge of physics and mathematics. An avid reader and keen thinker, his philosophical writings are a joy to read. 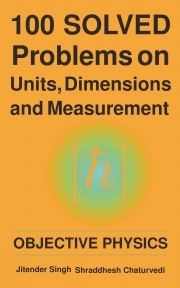 Reviews of "100 Solved Problems on Units, Dimensions and Measurement"